MCGS Menu Show search box. Sign up for The MCGS Review by clicking this banner and entering your email! The MCGS Review is the Multicultural and Gender Studies Department weekly newsletter. The newsletter is comprised of opportunities such as scholarships, grants, volunteer and study abroad opportunities. We will also include upcoming events happening both on campus and in the community. Sound good? Sign up today! Women of Wisdom is a unique evening at Chico State focusing on honoring the traditions, philosophies, and wisdom of the Native American community in the North State. Women of Wisdom highlights the contributions by, and value of, Native American women by focusing on their storytelling oratory. 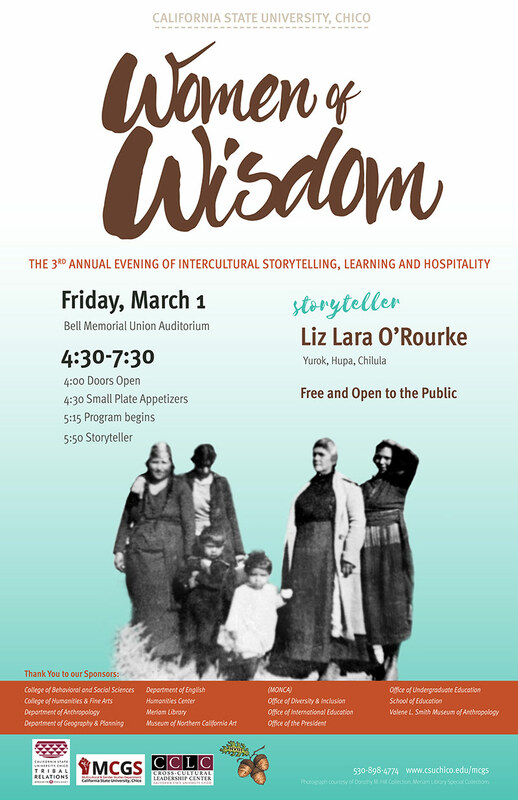 Through this event, Chico State hopes to foster a greater appreciation for the wisdom of our local Tribal communities with a key focus on women's experiences. Long-time family friend of Daisy and Lily Baker, Ms. Kit Kurtz has loaned the Valene L. Smith Museum of Anthropology a collection of baskets made by Lily Baker, Daisy’s daughter. A selection of Lily’s baskets will be exhibited at the Women of Wisdom Event for all to enjoy and appreciate the mastery and techniques of Lily’s baskets, reflecting generations of talented and skillful Mountain Maidu basket makers. Ali Meders Knight is a local Mechoopda Tribal member and active Chico community member. Ali is a traditional Basketweaver as well as an Artist who has several public art works installed in Chico. She has continually advocated and taught T.E.K. (Traditional Ecological Knowledge) in the Chico area for the last fifteen years and currently volunteers and teaches at schools and other organizations. Ali has been using her experience learning and teaching Traditional Ecological Knowledge as well as speaking publicly on Chico history from a Mechoopda perceptive as an inspiration for her art work. "The empowerment of the feminine spirit and creating spaces that reflect Mechoopda culture and identify are the most beautiful images in my mind's eye." In addition, we will have an exhibit featuring basketry woven by honoree and local artist Susan Campbell, a descendant of the Yahmonee Maidu, Hammawii Pit River, and Washoe tribes and current member of the Susanville Indian Rancheria in Susanville, California. For the past 20+ years, Campbell has been training in and practicing traditional uses of natural materials and basket making with other local master weavers and has been a member of the California Indian Basketweavers Association since 1994. Descendant of the Huba, Yurok, and Chilula tribes of Northwestern California, Elizabeth Lara-O'Rourke lived in Humboldt County her whole life and currently resides in McKinleyville. Married and with four children, this storyteller draws inspiration from life lessons as well as from her family. Having been raised in a very traditional family, her stories reflect the values of an ancient world while incorporating ideals of the modern world. Her stories are hailed for their humor and charm. North Valley Indian Health, Inc.
Want to know about past events?